The SepraEight® condensate treatment process utilizes a unique regeneration technique which assures optimum separation of cation and anion resins, essentially eliminating the potential for cross-contamination of resin during the regeneration process. The process utilizes a two-vessel, bottom transfer regeneration technique that provides the user with considerably greater flexibility and superior treatment performance. Elimination of resin cross-contamination, without the use of secondary density separation methods. Low susceptibility to operating difficulties should resin inventory become imbalanced. Capability of varying resin ratio without major mechanical changes. Capable of positive cation resin fines removal. Capable of ammonia cycle operation. Capable of employing secondary density separation. Capable of employing “Resin-On-Resin” techniques. Capable of employing “Anion underlay” technique. Advanced flow distribution and collection in the service vessel design maximizes ion exchange resin utilization. This feature is applicable to all types of deep bed systems provided by Graver Water Systems. 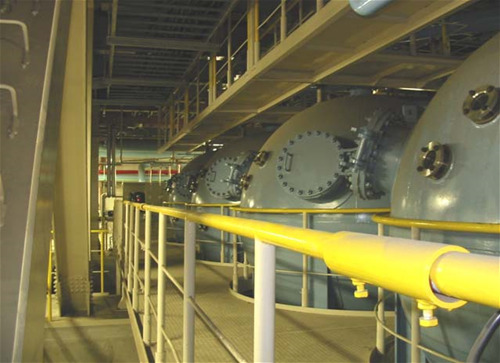 Graver’s patented Powdex® condensate polishing system is a precoat filter demineralizer providing both suspended solids removal and ion exchange capability in a single vessel. The process utilizes fine particle size ion exchange resin in combination with fiber materials to form a precoat on specially designed filter septa. This precoat of ion exchange resin and fiber provides excellent filtration performance and rapid ion exchange kinetics to produce the effluent quality required to satisfy the high demands of today's utility and industrial applications. A key feature of the Powdex ® system is that the precoat can be readily changed. As a result of this feature the resin ratios and ionic forms of the exchange materials can be modified and tailored to meet changes or upsets in the cycle chemistry. In addition, since the ion exchange material is single use operation and disposable, the anion exchange resins are not constrained by the same temperature limits imposed on deep bed systems, allowing for higher system operating temperatures. • Sealfast® Adaptors, for installations free of resin leakage. • Air Surge® High Energy Backwash, for superior septa cleaning. • Advanced Precoat Systems, for more uniform precoat application. • Internal Distribution Tube, for enhanced precoat and inlet flow distribution. • Body Feed Systems, for continuous precoat replenishment or overlay applications. Suitable for condensate applications where only filtration is required, the backwashable AFA or AFA 2000 filter elements will meet the demands of multiple-backwashings without the loss of the filter’s integrity for retaining iron oxide particles. The filter media is available in absolute ratings ranging from below 1.0 micron to over 20 microns. Like all Graver Technologies condensate filter elements, a variety of end fittings can be provided to retrofit the elements in existing Powdex® systems or adapt them to retrofit other condensate filter systems. The DualGuard filter combines the advantage of a pleated absolute rated filtration media for retaining iron particles with an outer retaining wrap thereby ensuring the resin precoat evenly coats the surface of the element without becoming lodged between the pleats. A selection of absolute rated filter media is available ranging from below 1.0 micron to over 20 microns. The filters exhibit excellent mechanical strength for backwashing. The 100% plastic construction facilitates disposal by crushing, incineration or shredding at the end of their useful life. The manual or automatic high flow filter is designed specifically for use in condensate streams or other critical applications where superior crud holding capacity or corrosion product transport removal capabilities are essential. These high flow filters can be installed in the utility’s condensate stream separately, prior to a deep bed condensate system, after a make-up ion exchange system or as pre-filters before a membrane system. 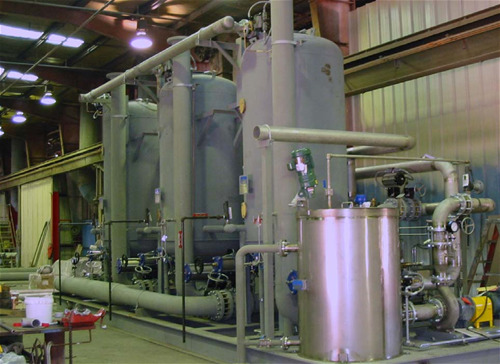 The pre-filter elements are available in a variety of micron retention ratings from 1 to 100 microns, lengths ( 20, 40 or 60”), and gasket materials to meet your specific project needs.